I am packing for RWA, taking off tonight to go to Mom's then we leave from her place tomorrow at 4:30 am. First public appearance (not the swarming in front of the hotel reservation desk, or the conference registration desk), is TUESDAY at the LITERACY SIGNING (see link above). Also workshop on Wednesday 4:30 p.m. -- Kill Your Inner Critic! You do have to belong to the conf for this. As well as the free book giveaway Berkley signing at 9:00 on Friday am. As you write, you learn about your characters as the scenes develop, especially if you are in their Point of View or head. Today I learned that one of the concerns that my hero, Garrett Primross of Heart Secret, has is that he leaves a legacy behind him of something. Family, good work, whatever, this is something important to him. May you enjoy learning something today. I am offering the opportunity to name a geographic feature of Celta, ARCS Enchanted Ever, Heart Search, Hearts & Swords. Since I just emailed the offer of the donation, it may take a while to get up. Please donate or consider the auction. 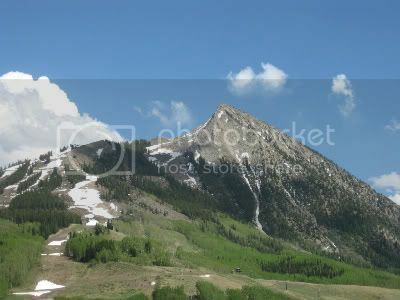 Crested Butte is one of the most beautiful spots in Colorado. I got back from Grand Junction and now am going to Crested Butte. I'll be doing: Kill Your Inner Critic! Experience the Joy of Writing! (which I've practiced, and, to the Cats amazed amusement went through in my bed last night). Also giving: Survive to Write, Write to Survive, How to Hang In There Until You're Published, practical techniques. Otherwise I've been doing emails, relaxing, some words on Heart Secret. Going to review people's first 2-3 pages in Grand Junction tomorrow. A good rule of thumb for those is: Hook, Emotional Hook for Protagonist, Reader; then the journalism rules: Where, When, What, and most of all, WHY. I am having a rough economic patch and must limit my book purchases. But I am not stealing books and hurting authors who also depend on sales to live. I am not stealing books by authors I only think are so-so and not entirely sure I want to read. I cut 4100 words out of Enchanted Again at editor's request, mostly brownie and worldbuilding scenes, as well as changing word choice and overall tightening. I'm hoping not to see this again for a while. If I can get my website back on track, some of the cut scenes will be posted there. However, I think I'll stay in the same universe -- fantasy Mystic Circle in contemporary Denver, at least this week, to work up the next (last contracted, but hopefully not the last in the series!) book.